Our records show that you purchased an Observer® thermostat which was manufactured between 2011 and 2014. In some instances, when the thermostat is set to "COOL" mode, the thermostat may send a call for heating which could cause your furnace to turn on. Your furnace could be gas or electric heat. If your gas or electric heat is running while the thermostat is set to "COOL" mode, it could lead to an uncontrolled over heating of the living space. To eliminate the potential safety risk, International Comfort Products (ICP) initiated a safety campaign to check, and if necessary, update the thermostat's software. ICP reported the potential safety risk to the U.S. Consumer Products Safety Commission and Health Canada. The objective of the safety campaign is to eliminate the potential safety risk. Please immediately change the thermostat mode to the "AUTO" mode (follow the instructions in the attachment to change to AUTO mode). Next, following the instructions in the attachment, please locate your thermostat serial number and software version. Write down the thermostat serial number and software version. 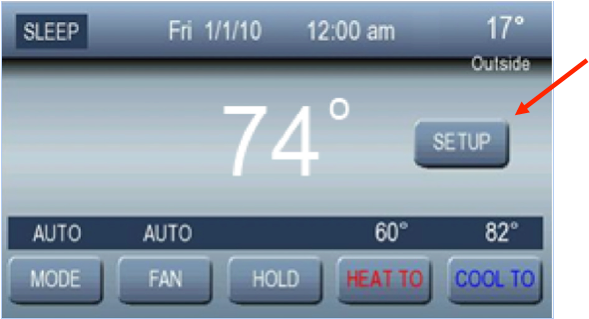 If your thermostat software version is a number less than 2.00, the serial number will not be displayed on the screen. If you have internet access, you can go to www.myobservercomfort.com/non-wifi-safety to report your thermostat software version and serial number. If you do not have internet access, please call the ICP brands customer care number at 800-649-4706. They can determine if your thermostat needs to have a software update based on the information you provide them. They can also help you locate the software version if necessary. Since you registered your product(s), you may also receive a phone call from your HVAC dealer. 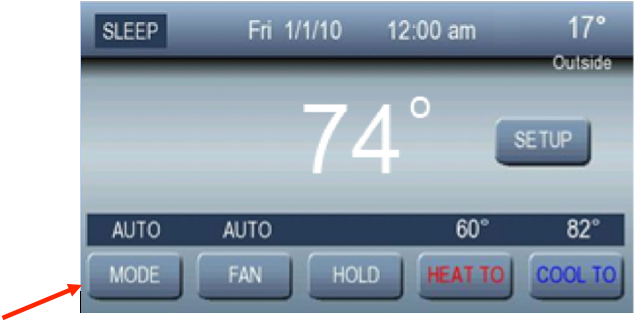 If your thermostat software needs to be updated, your HVAC dealer will need to make a visit to your home so that a technician can complete the service. There will be no charge for the service call to update the software. If your thermostat’s software needs to be updated and you do not have a preferred HVAC dealer, you can call ICP customer care at 800-649-4706 for help in selecting a dealer or use the dealer locator at your equipment brand website. All non-WIFI Observer® thermostats, model TSTAT0101SC, that are still in service are required to be verified. While we realize the inconvenience this may cause, ICP is initiating this campaign to protect all customers. ICP is committed to ensuring the safety and well-being of our customers and consumers of our products. ICP continually monitors and evaluates the performance of its products in order to ensure its customers are experiencing the quality and safety they expect from an ICP product. When any situation or condition arises that affects the safe operation of ICP equipment, immediate action is taken. Note: some thermostats may have been user configured with a 4-digit keypad lock. If this is the case, enter the 4-digit code in order to unlock the screen. If you do not know the 4-digit code, the calendar year programmed into the thermostat can be used. For example, if the home screen shows the current date as 7/1/18, enter 2018 as the 4-digit code to unlock the screen. Press AUTO to select the automatic changeover mode. In AUTO Mode the thermostat will choose the correct mode to operate based on the heating and cooling setpoints entered by the user or the program schedule entered by the user. Write down the software version and the serial number, then press the Back button to get the previous screen, then press the Back button again to get to the Home screen. If the software version is a number less than 2.00, the serial number will not be displayed on the screen. 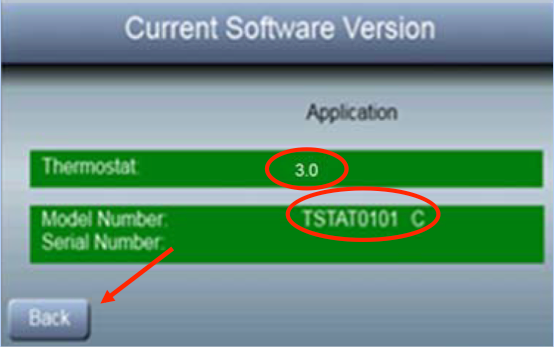 Software versions 1.00 and 1.01 do not display a serial number, therefore no serial number entry is required.